I’ve written a paper (not yet online) [Update 5/28/17: now online here] about graphical statics. In order to demonstrate that the “form-finding” objectives of such techniques are often superficial and flawed, I needed to provide a case study of an actual structural design problem, using real materials and real design methods, that accounts for things (like the buckling of bars in compression, or shear lag and effective net area of bars in tension, or deflection issues) that graphical statics ignores. So I created an enormous spreadsheet to find the optimal (lightest) steel double-angle Pratt or Warren truss for any given span, spacing, and loading condition. 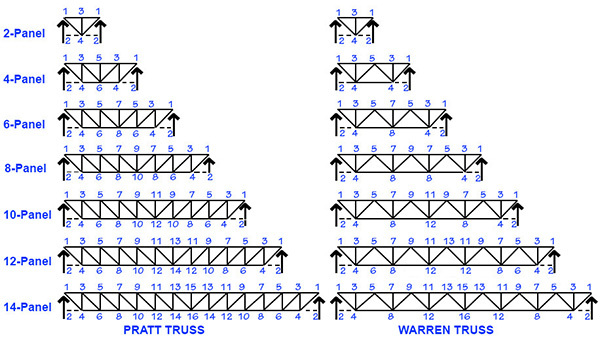 The spreadsheet actually designs 105 different trusses (with aspect ratios ranging from 2:1 to 16:1; and with from 2 to 14 “panels,” as shown in Figure 1) in order to find the optimal combination of aspect ratio and panel geometry for a given span, spacing, and loads. Well, the spreadsheet had well over 1,000,000 cells and couldn’t be converted to an online calculator using the software I have. Therefore, I made a smaller version of the same spreadsheet — this one only designs a single truss (rather than 105 versions) and only considers whatever aspect ratio and panel geometry have been selected. However, this calculator can also be used to find the lightest truss, but only by trying out numerous geometries while keeping track of the truss weight. This entry was posted in Architecture, Writings on July 24, 2016 by jonochshorn. otherwise.. i find ALL your .. ‘Web-Entries..’ the most useful design-aids… on the entire web..
please advise…. thank you Bill Bernick Toronto On… CANADA..
I’m using “aspect ratio” to mean the ratio of the overall truss length (span) to the truss height. In other words, if the truss spans 120 feet and is 10 feet high, then its aspect ratio is 120:10, or 12:1.